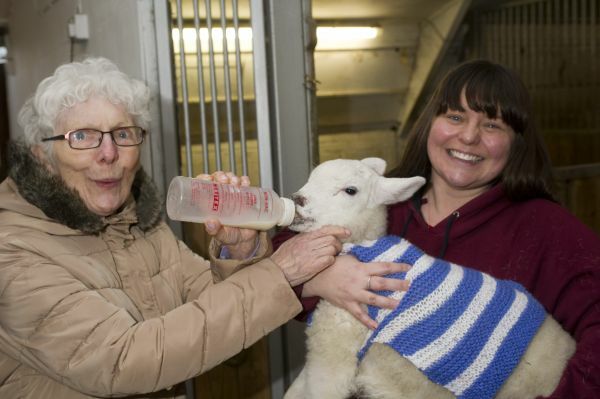 A group of creative residents at Scarbrough Court care home in Cramlington have been knitting up a storm to help newborn lambs at Whitehouse Farm Centre near Morpeth stay warm this Easter. The kind-hearted residents, all over 60, are part of the care home’s Knit & Natter group and regular visitors to Whitehouse Farm. Following the atrocious weather in the form of ‘The Beast from the East’, they decided to get knitting to give the lambs some extra insulation in the cold weather and went along to see their colourful creations working their magic. Dot Leddy, a care support worker at Scarbrough Court, which is run by the Royal Masonic Benevolent Institution (RMBI) Care Company, leads the Knit & Natter group supported by activities coordinator Stacey Hunter. Dot said: “We have a great relationship with the team at Whitehouse Farm, some of our residents are living with health conditions including dementia and Parkinson’s, so taking part in stimulating activities and having the opportunity to interact with animals can be very beneficial. Dawn Peters, events coordinator at Whitehouse Farm Centre, said: “We’ve been blown away by the kindness, time and effort the Knit & Natter group have put in to make the jumpers. They look fantastic and are doing an important job supporting the lambs in their first few weeks. Whitehouse Farm Centre celebrates its 21st birthday this year. Working with local care homes, community groups and charities including MIND Active in Northumberland is enabling the Farm to reach out and share the ‘animal magic’.